While in Coolidge, several members of our group had ideas of a day trip to do. We decided to combine them all into one loop drive. We drove over to Florence, then to Kelvin on the Florence-Kelvin "Highway" (really a dirt road), then north to Superior, then back to Coolidge through Florence Junction. Our first side-trip was Chuck's idea. He was looking for a place to take out kayaks. This is near Cochran, probably not on any map. We found the Gila River, but didn't think it was doable. The trees on the road leading to the river were not tall enough for cars with kayaks on top. So on to our next goal. On the way, the cactus were gorgeous. Bill and Lois remembered seeing these stray boulders out in the middle of nowhere on the Florence-Kelvin "Highway," and wanted to show them to us. Wow! Combined with the cactus, they were just beautiful. We decided to have lunch here. And look at some of the graffiti. On the way north to Superior we went by this copper mine that is 6 miles long! That is a huge electric shovel down there. Compare it to the size of the tiny trucks around it. (The trucks on the left are gigantic in their own right.) The shovel was powered by a VERY long extension cord. But my goal on the trip was to find poppies. They are early this year, and I found on the internet that there was supposed to be hillsides of them just north of Superior on Silver King Mine Road. Sure enough, you could see them for miles around! Before leaving Mesa, AZ, 8 of us had dinner at Organ Stop Pizza, home of the largest Wurlitzer theatre organ in the world. The organ boasts nearly 6,000 pipes, and they are powered by 4 huge turbine blowers. The place is packed every day in the snowbird season, and we had trouble finding seats. These cats entertained us while we waited for our pizza. The pizza was so good I forgot to take a picture of it. But I did get a shot of dessert! From Mesa, I moved down to Coolidge, where a dozen WINs are having a small gathering at the Elks lodge. They have rusty stuff at the entrance! I like it already. The lodge owns the vacant lot next door, and we settled in. A few miles away is Casa Grande National Monument. The name, of course, comes from the highlight of the site, the Great House, built in the early 1300s. Originally 35-feet tall, it is protected by a gigantic cover, and surrounded by remnants of other buildings. It was built without the use of forms, using 3000 tons of Caliche Mud, made by mixing water with caliche, a concrete-like substance found a few feet under the ground. One of their biggest problems in the preservation of the ruins is this little ground squirrel and his buddies. Inside the Visitors Center are lots of items recovered nearby, including this gigantic pot. Another fantastic sunset. I know this looks a lot like the one on my header - that was taken in Florence Junction, not too far from here. Next - searching for poppies! Just How Many Cameras Do I Have??? Well, I'm not telling, but these are the 4 that I use most often. The smallest is the Canon PowerShot Elph 300 HS. "HS" stands for high-sensitivity, and improves photos taken in low light. It is a wide-angle camera and has a 5X optical zoom, with a 35mm equivalent focal length of 24-120. Since it's so small, I usually have it in my pocket for when I happen upon "blog fodder." A little bit bigger, thicker, and heavier is the Canon PowerShot SD 4500 IS. It will still fit in my pocket, but has a 10X optical zoom, a 35mm equivalent focal length of 35-350. The lens is a lot bigger than most of the other point-and-shoot cameras, and I think it takes some really sharp pictures, even when zoomed to 10X. This photo was taken from the top of Magic Mountain in Moorea, zooming in in the oldest church in French Polynesia. I bought an underwater camera for the trip to the South Pacific, the Canon PowerShot D10, with a 3X optical zoom. It's also good for kayaking or rainy weather. I got some great snorkeling shots. My only complaint is that the color of the camera looks too much like a fish, and I almost lost it to this guy in the Cook Islands. Fortunately I had it tied to my wrist. As you can probably tell, I am VERY partial to the Canon point-and-shoot cameras. I think they are the very best around. But on the SLRs, I go for the Nikons. This is my newest addition, a Nikon D3100. It's an entry-level SLR, but just fine for me. It's lighter weight than the better SLRs, and I am more likely to take it along. So far I only have one lens for it, but I'm working on getting an all-purpose wide-angle/telephoto lens. In addition to the better quality photos the SLR takes, you can also put filters on it, like the polarizer I almost always use, to make the sky look better and reduce reflections. I promised an update on my new Jack antenna after I got it installed. It was very easy to install - I did it myself! Just take out the two pins holding the old batwings, and reinsert them after swapping for the Jack. I put a little piece of blue foam on the base to keep the antenna from bouncing on the roof while I am going down the road. I'm in Apache Junction, and all the stations seem to be on South Mountain on the other side of Phoenix. So I aimed the antenna (the flat side) in that direction. I got 71 channels!!! I should have scanned with the old batwing, so I could compare, but I am pretty impressed. To find out what direction to aim the antenna, go to antennaweb.org here. Another project - I found this small bookcase at Walmart for $28. I split it in two - putting the top part under one side of my "all purpose table." And the other half upside down under the other side. The sliding drawer under the desk is also new. I got the drawer at The Container Store, and the strip that it slides on at Home Depot. It's tight enough that I don't need a lock on it when I'm traveling. When I took the dinette out in 2007, it left an unsightly area under the new table. When Molly was alive, I would open the bay door so she could look out. But she's been gone for 2 years now and it's time I closed up the opening to the outside bay. I used pieces of material and vinyl from the dinette cushions. It's not perfect, but certainly better. That's it for now - Good Night! Tuesday, Feb 14th, is more than just Valentine's Day. It's the 100th anniversary of Arizona's statehood. It's hard to believe it's only been a state for that long. Since I've spent most of the last 16 months in the state, I thought I'd go through my favorite places, most of which I saw this year, and what makes Arizona so unique. Of course the Grand Canyon is a biggie! The Organ Pipe cactus is here, the only place in the US where it grows. And the Saguaro cactus in the US grows only in Arizona and a tiny part of California. I got to see them bloom this year. And Antelope Canyon near Page. I have been to the Wave 4 times over the last 14 years and hope to go again this year. It's located in Arizona, but you start hiking in Utah. 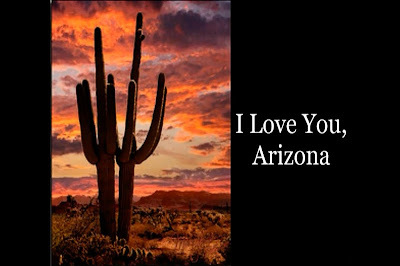 If you want more, I found Rex Allen Jr's beautiful song, "I Love You, Arizona" here, complete with some gorgeous photos, including Havasu Falls, which is still on my bucket list. The song is guaranteed to bring tears to your eyes.